Last week’s winner meal in our home, two thumbs up from both of us, this recipe is a bit unusual for a “cacciatore,” as it contains very few ingredients, and omits the traditional peppers and onions that most versions are loaded with. Two little twists in the recipe: the use of porcini mushrooms and the way it handles the parsley. Normally, parsley is added at the end of cooking to preserve its freshness, but in this case Chiarello adds most of it right at the initial stage, and saves some for sprinkling on top of the dish at serving time. My main modification, as often happens with braised chicken thighs, was to increase cooking time by a long shot. Place the dried porcini mushrooms in a small bowl or glass, and add the hot water. Leave them sitting in the water for 30 minutes. Remove the mushrooms with a slotted spoon; finely chop. Strain the liquid through cheesecloth to catch any dirt or solids, and reserve. Sprinkle chicken with salt and pepper. Heat the olive oil on a large skillet, add the chicken, skin sides down; cook 8 to 10 minutes or until golden brown, turn and cook the other side for 3 to 4 minutes. Transfer chicken to a platter; remove all but 1 tablespoon of oil from skillet. Add garlic to oil in skillet; cook over medium heat about 30 seconds, stirring occasionally, until fragrant. Stir in 2 tablespoons of the parsley; cook for a minute, stir in mushrooms, tomato puree, chicken broth, 1/2 cup water and reserved mushroom liquid; heat to a simmer. Add chicken, skin sides up; reduce heat to low. Cover; cook until done to your liking (I cooked for 50 minutes in a very gentle heat, turning the pieces a couple of times during cooking, ending with them skin side up). Transfer chicken to a serving platter. Increase heat for sauce to high; boil sauce 6 to 8 minutes, stirring occasionally, until thickened. To serve, spoon sauce over chicken; sprinkle with remaining 1 tablespoon parsley. Dried porcini mushrooms are one of my favorite ingredients. They wait patiently inside the bag, and once you add warm water, they soak it, turn all soft, and fill your kitchen with that intense mushroom-y smell that is a sure sign of a fantastic meal ahead. Michael Chiarello hit the jackpot when he combined porcini and parsley, in a sort of minimalist approach that needs nothing else to shine. According to his recipe, you only need to cook the thighs for 20 to 25 minutes. I always go for a “falling off the bone” tenderness, and that is not even close to happening in less than half an hour. Use your own favorite method. This was a very tasty recipe, perfect to make ahead for entertaining. 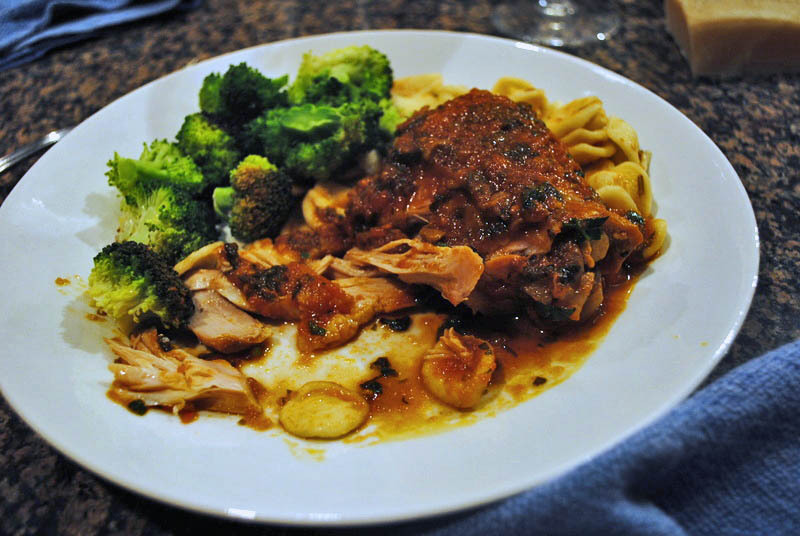 We enjoyed it with some orecchiette soaked in the cacciatore’s sauce, and stove-top blasted broccoli. This dish has been a staple in my home for quite a while. The smell alone immediately signals cooler weather is on the way. The hot summer we had makes it extra special! One thing, we have found the recipe very adaptable. Whether it’s different mushrooms, more tomato or broth, or using breasts instead of thighs, all tweaks have been yummy. Thank you for posting this! I love falling off the bone too!! And I love Michael’s recipes!! I like the minimalist approach to preparing food allowing the simple great flavors to shine. Your last photo makes this dish look so delicious!! The porchini give an almost magical taste to this dish, Sally. Thanks for the reminder! It’s seemingly simple, but that’s not the way it tastes…. I know this recipe was highly praised at Cook’s Talk years ago, and for good reason! Always a great dish, love it with porcini! I make it in the pressure cooker to speed up the “falling-off the bone” result! Always delish! Jim, my pressure cooker is just out of storage, and I will be using it soon, it’s that time of the year! It’s so true how one or two well placed ingredients can carry an entire dish like the porcini mushrooms and parsley here. Funny enough, it was parsley in Ellie Krieger’s pasta (that we both loved) that was the distinguishing ingredient there as well. With the cooler weather I have been heavily in the mood for warm mushrooms, so this recipe comes at the perfect time. I have just one more small bag of porcini mushrooms in my pantry… must act soon! Dried porcinis and the parsley twist. I’m loving this. Thanks for the shout out too! A lovely minimalist recipe! I like it that it skips the peppers. Instead of onions, in the fall and winter, I like to use 1 or 2 thinly sliced leeks (white part only, the green goes in the soup pot) sautéed until just tender, in lieu and place of the onions but after reading this post, I’ll try it without. Thank you! I almost never use onions, in fact sometimes I include them in the recipe, but my husband doesn’t deal with them too well, they make him sick. Garlic and onions are almost absent in our cooking, so we tend to get other flavors in a much more intense way. When we go out to eat, I find that the onion and garlic flavors are overpowering. Interesting how a small change in cooking can affect the perception of flavors. That dish looks so satisfying and delicious! Perfecvt. I have enjoyed catching up on your posts after returning from Europe. 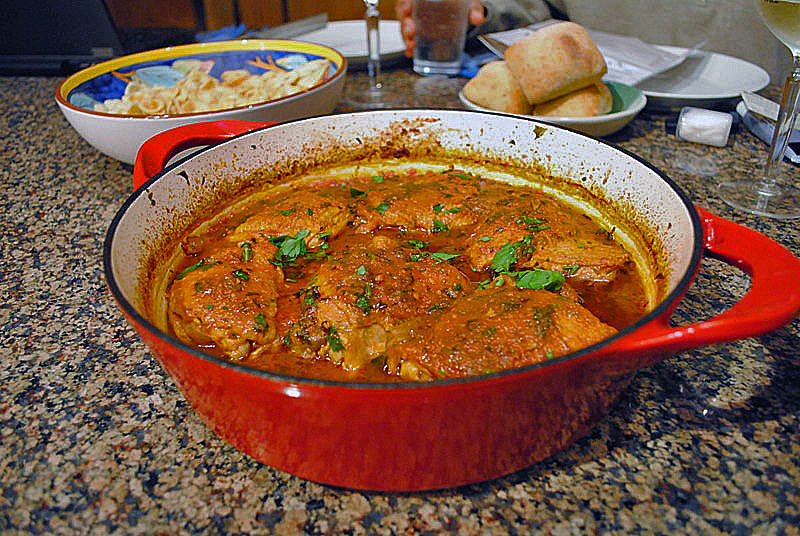 The chicken cacciatore sounds delicious…especially with the earthy taste of porcini mushrooms. Como sou curiosa – coisa de jornalista, que sou – vi seu nome no blog da Angela e vim conhecer. Fiquei feliz em ver um blog tão bom em inglês produzido por uma brasileira. É bom ver nossos conterrâneos brilhando em outras terras. Lylia, que delicia ver seu comentario! Prazer em conhece-la tambem, eu vou sempre ao blog da Angela, que adoro! Vou visitar o seu right away! That looks delicious, Sal! I’ve never made chicken cacciatore, but I’m instantly taken with the deep orange colour of the stew! I haven’t made this dish in so long! Love the fact that you added porcini mushrooms, so flavorful! So interesting that he skips the peppers and onions, but the porcini do sound delicious. This is such a great fall meal. Can’t wait to try this on a nice, cool night!